"Just Born, Inc., makers of MIKE AND IKE®, PEEPS®, HOT TAMALES® and GOLDENBERG’S PEANUT CHEWS® Brand candies, confirms rumors that the legendary candy duo, Mike and Ike, have parted ways. The pair cited irreconcilable creative differences, which has been confirmed by statements from each party suggesting that Mike and Ike will stop collaborating on their famous fruit chewy candies. The news of split has caused people to be overcome with disbelief. Therefore, the company has launched the “Tell Us Your Reaction” contest to run from now through June 26th, 2012. Entrants must create and submit a video that demonstrates their reaction to the MIKE AND IKE® split. This could show surprise, sadness, disbelief, happiness or whatever emotional reaction the news of the MIKE AND IKE® split evokes. The reaction video should have a maximum running time of 90 seconds. One first prize winner will received an Apple iPod Touch and a MIKE AND IKE® t-shirt. Four second prize winners will each receive an Apple iPod Shuffle and a MIKE AND IKE® t-shirt. Fifteen third prize winners will each receive a case of MIKE AND IKE® candy and a MIKE AND IKE® t-shirt. Entrants will need to fill out an entry form found on the MIKE AND IKE® facebook page under “The Story”, at www.facebook.com/mikeandike, which will ask them to provide their reaction video. 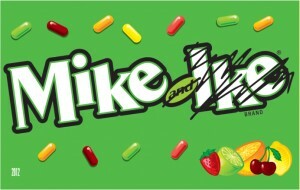 For more information on the split and to follow Mike and Ike’s individual exploits, log onto www.facebook.com/mikeandike." Even though they've split, Mike & Ike candies still taste just as good as before:) Grab a box and enter the contest today! ABCD Diaries gives Mike & Ike candies an A+!